Today, we got some information about how the Living World will function now, and just let me say. I am one happy sylvari right now. The new Story Journal was introduced today, which is how season 2 of the Living World will work. Originally I was planning on going over how this new system will work…but it’s already well-explained in Colin’s post. So I won’t. What I will do, though, is write about what I think of this new change. And the short of it? I really, really like it. Everything about it is a step in the right direction. First and foremost, content will now be permanent. So long as you’ve unlocked an episode, you can replay it to your heart’s content on any level 80 character on your account. It will always be there for you to do. One of the things I really enjoyed about GW1 was the replayability of the game – if I had completed a mission, I could always go back and replay it. 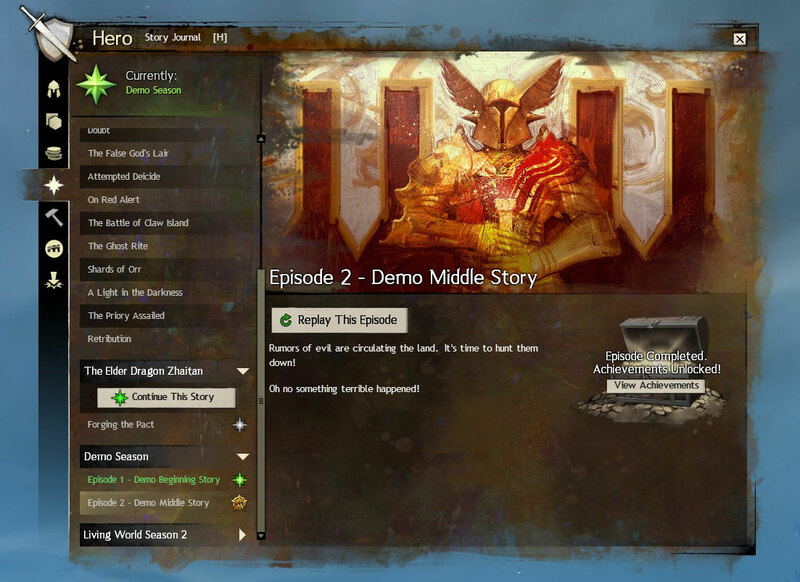 I had been disappointed with how that was not possible in GW2 thus far – with personal story you can still replay it on different characters (though you cannot replay past steps), but LS season one was completely unable to be replayed. I could not go back to do any of it again on a different character, even. No longer will that be the case. To unlock an episode, you simply have to log in once during the two week period in which it’s available. That’s it – just pop into the game for a moment and it will forever be available on all of your characters, though you can only play it on a level 80 character. Now, say, you are unable to log in at all during that time period and you miss an episode. 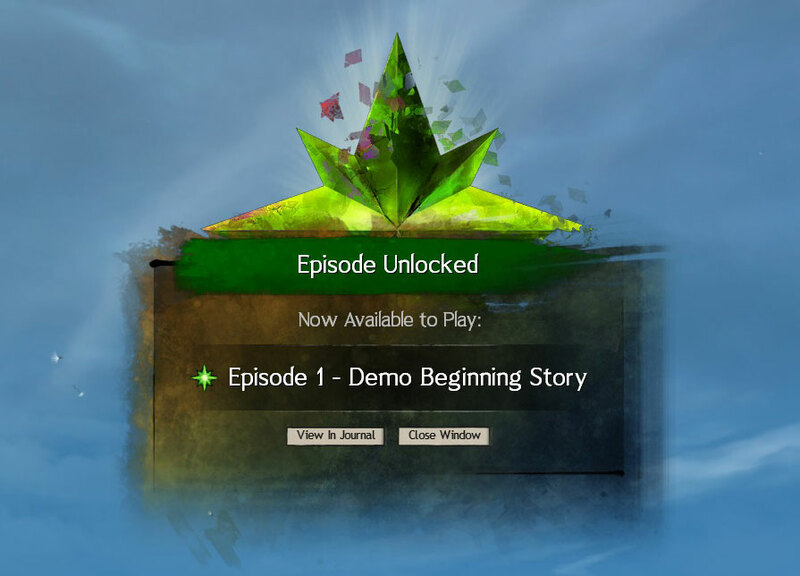 You’ve gone on vacation, or your computer broke, or let’s say you’re simply new to GW2 entirely and you missed a few story episodes because you hadn’t had the game yet when they released. You won’t have to miss it forever. The option to unlock an episode for gems is a good one, I feel. The content is free for people who play regularly (or who just log in every couple of weeks), while still being available to be purchased for those who have missed out on it. 200 gems per episode may seem a bit steep, but think about it in the long run. If they do new content every two weeks for a full year and you miss all of it, that’s going to be just about $60 to purchase it all in one go, and that’s assuming they don’t do some sort of Season 2 pack where you can buy it all in one go for a discounted price. Frankly, I’d be surprised if they didn’t do that. But also think of this – I remember interviews released during Escape and Battle of LA (though now I cannot find them for the life of me) saying that they were going to try and aim for shorter story arcs. If they keep to the biweekly release schedule, ten episodes is five months’ worth of content – and if you miss everything, it’d be 2000 gems to unlock. That’s $25. That’s certainly less than an expansion would cost. So the pricing feels right. The biggest quibble I have with it is the gold to gem ratio is currently pretty insane; I feel like something needs to be done to control that a bit more so that converting gold into gems will be a viable option for someone who wants to play an episode they missed. I’m also a fan of the changes to rewards. You’ll get rewards for completing the episode itself, and there’ll be new rewards added to open world content through each episode. It is separating itself from achievements; previously most rewards required you to complete the meta-achievement. They aren’t tied any longer, but the achievements aren’t going away entirely – a set of achievements, said to be fairly challenging, will be unlocked by completing the episode. This is great for multiple reasons – people who want to just play more casually and care more about the story can still get their rewards. People who are achievement hunters can still do that – and since they’ll always be available once unlocked, no one will have to feel like they must rush to complete everything. This will also solve a problem that I know I fall into with most releases – play the new content, speed through the meta, and then find there’s little else to do because, well, I’ve done it all! I’ve commented before that tying the LS releases so closely to achievements basically makes everything feel like a checklist. I do hope this means that releases will be much more heavily story-based; if they are given more freedom to work with the story and don’t have to worry about it being completable quickly, I feel like this will help the story’s quality and they can play around more. In all, these are great changes, and I am very happy with this. It shows that ArenaNet was listening to what people wanted. We get new free content, but no one has to miss out on it forever. We can replay it – it won’t be going away. We can take our time to get through the story instead of having to rush it. This is a vast improvement over how things were handled in season one. Well done, ANet – this is all good stuff, and benefits all of your players!